This article is about the anime and manga series. For the video game adaption, see Afro Samurai (video game). Afro Samurai (アフロサムライ, Afuro Samurai, stylized as ΛFΓO SΛMUΓΛI) is a Japanese seinen dōjinshi manga series written and illustrated by manga artist Takashi Okazaki. It was originally serialized irregularly in the avant-garde dōjinshi manga magazine Nou Nou Hau from November 1998 to September 2002. Inspired by Okazaki's love of soul and hip hop music and American media, it follows the life of Afro Samurai who witnessed his father, Rokutaro (owner of the No. 1 headband) being killed by a male gunslinger named Justice (owner of the No. 2 headband) while he was a child. As an adult, Afro sets off to kill Justice and avenge his father. Volume one of the Afro Samurai manga remake, first released in America by Tor Books and Seven Seas Entertainment. The Afro Samurai dōjinshi was adapted into an anime miniseries by Gonzo in 2007, along with the television film sequel Afro Samurai: Resurrection in 2009, which gained two Emmy nominations, for Outstanding Individual Achievement in Animation, which it won and Outstanding Animated Program (For Programming One Hour or More). After the release of the anime series, Okazaki remade the original Afro Samurai dōjinshi into a two-volume manga. To be only released in North America, Tor Books and Seven Seas Entertainment licensed the title and published it under their new Tor/Seven Seas imprint. In addition to the success of the anime series, Afro Samurai has also been adapted into a video game and an upcoming live action feature film. For the TV series and the film, two soundtracks by the RZA of Wu-Tang Clan have been released as well as a profile book in Japan. In a feudal yet futuristic Japan, it is said that the one who wields the Number 1 headband is the best swordsman in the world and shall possess god-like powers. Some believe that the Number 1 headband grants immortality. Others believe that the headband had been sent down by gods. The only way to obtain the Number 1 headband is to challenge and defeat the current wearer in combat. However, only the Number 2 can challenge the Number 1 whereas anyone can challenge the Number 2. Thus, whoever wears the Number 2 headband risks constant attack. The Number 2 headband's current owner Justice fights and kills Rokutaro, Afro's father and owner of the Number 1 headband. Afro Samurai witnesses the fight and vows revenge against Justice who tells him to seek him out when he is "ready to duel a god." Years later, Afro is the Number 2 master swordsman. He kills the Empty Seven Clan and various assassins, recalls his past memory, and goes to Mount Shumi. He also confronts his vengeful childhood friend Jinno. Afro discovers that there are other headbands in existence, ranging to an unspecified higher number and sees that the corpses of those who wore them are skewered throughout Justice's safe house. Afro kills Justice and takes the Number 1 headband, and all of the headbands disappear. Afro returns and lives in the mountains to confront Jinno, who is adorned with every headband in existence and seeking revenge. The final scene shows that Justice has returned from the dead. However, the story changes in Afro Samurai: Resurrection, when Jinno takes Rokutaro's corpse, while Jinno's sister Sio takes the Number 1 headband and asks Afro to find the Number 2. After taking the headband from Shichigoro, Afro confronts the resurrected Rokutaro, who kills Jinno and Sio. Afro defeats Rokutaro, gives the Number 2 headband to Kotaro and continues to wear the Number 1. Takashi Okazaki started drawing African-American characters on items like Kleenex boxes when he was a teenager, inspired by his fondness for hip hop and soul music. He also drew ideas from American media and their depiction of Japanese culture. Takashi started combining elements of samurai into his work, eventually developing the design for Afro, which was also based in the legendary black samurai Yasuke who existed during the Sengoku period of Japan. Okazaki began writing the original dōjinshi, then called Afro Samurai!, when he and his friends started independently publishing the art magazine Nou Nou Hau. The preparatory "issue 0" of Nou Nou Hau was released in November 1998 with Afro Samurai artwork featured on the cover. Takashi Okazaki wrote the entire manga in the English direction, with elements from English and Japanese comics. He also used Afro Samurai for a cat food advertisement in the last pages of his manga book. In addition to the anime production, Okazaki re-made the dōjinshi, with an increased display of artistic skill. At the Japan Society from March 13 to June 14, 2009, original Afro Samurai dōjinshi artwork (as used on issue 0 of Nou Nou Hau) was showcased at the KRAZY! : The Delirious World of Anime + Manga + Video Games exhibition. 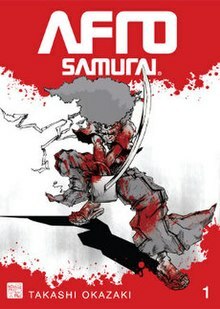 Written and illustrated by Takashi Okazaki, Afro Samurai was originally published in the self-funded Nou Nou Hau dōjinshi magazine. First appearing in issue 0, the dōjinshi version was first published from September 1999 to October 2000. After the release of the anime version, Takashi Okazaki recreated the original dōjinshi. Although the recreation of the original manga was created in Japan, it was first published in the United States by Seven Seas Entertainment and Tor Books in two tankōbon volumes. As a special supplement, thumb-nail sized clips of the original dōjinshi were shown at the end of the first volume. The English release of the manga was Tor Books and Seven Seas' first publication under the newly formed Tor/Seven Seas imprint. The manga was also released in Italy through Panini Comics' manga publishing division Planet Manga, starting on April 9, 2009. The manga was released in one volume in Japan on December 18, 2009. The limited edition came with all the issues of the original dōjinshi included in a separate volume. After witnessing his father beheaded by Justice, Afro with the No. 2 headband sets forth to avenge his father's death. On his way, he encounters and kills several foes. Afro kills Justice to take the No. 1 headband and challenges to reconcile with Jinno. One of Okazaki's friends decided to make action figures based on the character, which were released in small amounts. After the action figures were created, a producer from the Japanese studio, Gonzo, happened to find them and thought of an animated TV project based on the series. The anime took three years to develop, and in the three years the studio also created a trailer, which happened to fall into the hands of Samuel L. Jackson. It was announced that the series would be a five-episode "creative collaboration", between Samuel L. Jackson, Takashi Okazaki and Gonzo, with a music score by hip hop artist The RZA from the rap group Wu-Tang Clan. In 2006, it was announced that Funimation acquired the rights to the anime series which would premiere on Paramount Network later that year, and that Jackson would voice Afro. Afro Samurai debuted on January 4, 2007. The series premiered worldwide on Paramount Network's website, where they streamed the first episode online. On May 3, 2007, the series premiered on Japanese television, in English with Japanese subtitles, and for the first time completely uncut. On May 11, 2007, Funimation released the first Afro Samurai DVDs at Anime Central, at their own booth, the regular Afro Samurai: Paramount Network Version and the uncut Afro Samurai: Director's Cut. Both DVDs were released to the public on May 22, 2007. On September 4, 2007, all five episodes of Afro Samurai were released on iTunes. To promote this, Funimation released eight custom designed iPods by Takashi Okazaki. In 2008, Funimation released the Afro Samurai anime series onto Xbox Live in high definition format and also debuted on Blu-ray Disc in that year. Also in 2008, Afro Samurai was shown at the German Film Festival in Germany. As a boy, Afro witnessed Justice beheading his father and wears the No. 1 headband. As a man, he has the title of No. 2 and sets out on his journey of revenge. Afro relives his harsh past through his dreams when he is discovered by an old friend, Otsuru (Okiku) at a riverbank who tends to his wounds. In the present day, she attempts to kill Afro, but she makes love with him. She sacrifices herself to save Afro from the group of assassins. As The Clan of the Empty Seven continues to put pressure on Afro, he battles and kills them. Jinnosuke (Kuma) fights with Afro about the consequence lesson of choosing revenge over family and what it really means to wear the No. 2 headband. After killing Justice to take the No. 1 headband, Afro reconciles and battles with his childhood friend Jinno. In an Associated Press interview in 2007, Okazaki confirmed there would be a sequel to the anime series, and that it would air on Paramount Network. In 2008, the sequel was announced to be a television film, Afro Samurai: Resurrection, with Lucy Liu and Mark Hamill joining the cast. Hip hop artist The RZA also came back to provide the soundtrack for the movie. Afro Samurai: Resurrection debuted on Paramount Network on the night of January 25, 2009. On July 16, 2009, Afro Samurai: Resurrection was nominated for an Emmy in the "Outstanding Animated Program (for programming one hour or more)" category in the 61st Primetime Emmy Awards and the Creative Arts Emmy Awards. At the Emmy awards, Afro Samurai: Resurrection lost to Destination Imagination, a TV movie based on Foster's Home for Imaginary Friends. The art director of Afro Samurai: Resurrection, Shigemi Ikeda, won an Emmy for his work on Resurrection, which is the first ever awarded for work on a Japanese-animated production. Afro Samurai: Resurrection was the first Japanese anime to be nominated for and win an Emmy. Late 2009 also saw the release of Afro Samurai: Complete Murder Sessions on Blu-ray and DVD. A 4-disc collection of both Afro Samurai Director's Cut and Afro Samurai: Resurrection, together in one complete boxset. Announced at the 2006 Comic-Con, a live action version of Afro Samurai was said to be in the making. On July 21, 2011, Gonzo K.K. announced that Indomina Group had obtained the rights to produce the film, with Samuel L. Jackson, Jasbinder Singh Mann (Indomina Group Vice Chairman and CEO), Shin Ishikawa (Gonzo Studios) as producers; Eli Selden of Anonymous Content as executive producer. Production, however, stalled when Indomina Group suspended North American operations and shut its US office. In 2005, Gonzo had awarded Namco Bandai Games exclusive rights to publish two Afro Samurai video games, as announced that year. The debut trailer of the first game was released at the company's Editor's Day presentation. Afro Samurai was released for the Xbox 360 and PlayStation 3 on January 27, 2009. In 2015, Afro Samurai 2: Revenge of Kuma was released. Wu-Tang Clan member RZA produced the soundtrack for both the Afro Samurai TV series and the TV movie sequel Afro Samurai: Resurrection. The first soundtrack for the anime series, The RZA Presents: Afro Samurai: The Soundtrack was released on January 30, 2007 by Koch Records (now known as E1 Music). The second soundtrack for the TV movie, The RZA Presents: Afro Samurai: Resurrection: The Soundtrack was also released by Koch Records on January 27, 2009. On June 12, 2015, the Chinese Ministry of Culture listed Afro Samurai among 38 anime and manga titles banned in China. ^ "Afro Samurai". Seven Seas Entertainment. Retrieved August 30, 2018. ^ Solomon, Charles (February 2, 2009). "American, Japanese pop culture meld in 'Afro Samurai'". Los Angeles Times. Retrieved August 30, 2018. ^ Vachev, July. "Afro Samurai rundown". IFGN. IFGN. Retrieved January 30, 2019. ^ 木﨑文智監督、岡崎能士(原作者)インタビュー (in Japanese). Archived from the original on 10 December 2007. Retrieved October 28, 2007. ^ a b Epstein, Daniel Robert; Takashi Okazaki. "Afro Samurai: Takashi Okazaki Interview". 670 Broadway, 2nd Floor, New York, NY 10012: UGO.com/UGO Networks, Inc. Archived from the original on 2008-01-29. Retrieved August 31, 2009. ^ a b "NOU NOU HAU vol.0". Kugelblitz. 2005–2006. Archived from the original on 2011-07-13. Retrieved August 31, 2009. ^ a b c Okazaki, Takashi (February 2009) . Arnold, Adam (ed.). Takashi Okazaki: The Man BEHIND the 'Fro. Afro Samurai. 2 (1 ed.). Seven Seas Entertainment. ISBN 978-0-7653-2239-5. OCLC 223883056. 52-Uz2WVpVwC. Retrieved August 18, 2009. ^ Aoki, Deb (2009). "Afro Samurai by Takashi Okazaki". About.com. Archived from the original on 2011-08-27. Retrieved September 19, 2009. ^ a b "Tor Books Partners with Seven Seas to Form New Manga Imprint and Announces Publication of Afro Samurai". ComiPress. December 8, 2007. Retrieved September 18, 2009. ^ Okazaki, Takashi (2009) . Arnold, Adam (ed.). Afro Samurai, Volume 1. Afro Samurai. 1 (1 ed.). Seven Seas Entertainment. ISBN 978-0-7653-2239-5. OCLC 248983719. Retrieved May 20, 2013. ^ "Afro Samurai 1 (Di 2)" [Afro Samurai 1 (of 2)] (in Italian). Viale Emilio Po 380 41126 Modena MO Italy: Panini Comics/Panini SpA. April 9, 2009. Retrieved September 11, 2009. ^ "【アフロサムライ】AFROSAMURAI特別限定版(岡崎能士)[PCN掲載1月号]" (in Japanese). Parco. Archived from the original on 2010-01-21. Retrieved February 22, 2009. ^ a b "Afro Samurai" (PHP). Seven Seas Entertainment, LLC. 2004–2009. Retrieved November 2, 2009. ^ "Afro Samurai Vol 1". 175 Fifth Avenue, New York, NY 10010: Macmillan. 2009. Retrieved September 2, 2009. ^ "Afro Samurai Press Release". Anime News Network. May 5, 2005. Retrieved September 2, 2009. ^ "The RZA Gets His Afro Samurai On". Anime News Network. June 2, 2006. Retrieved September 14, 2009. ^ "Funimation Acquires Afro Samurai". Anime News Network. February 27, 2006. Retrieved September 2, 2009. ^ "Afro Samurai Hits Spike TV on January 4". Anime News Network. October 31, 2006. Retrieved September 2, 2009. ^ "Afro Samurai to Air on Japanese TV in May". Anime News Network. March 8, 2007. Retrieved September 2, 2009. ^ "Funimation to Sell Advance DVD Copies at Anime Central". Anime News Network. May 11, 2007. Retrieved September 3, 2009. ^ "Funimation Puts Afro Samurai on iTunes, Gives Away Custom iPods". Anime News Network. September 1, 2007. Retrieved September 3, 2009. ^ "Free Bakugan #1 on iTunes; HD Afro Samurai on Xbox Live". Anime News Network. February 29, 2008. Retrieved September 11, 2009. ^ a b "VideoScan: Afro Samurai Debuted on Blu-ray at #16". Anime News Network. September 10, 2008. Retrieved September 11, 2009. ^ "Eva:1.0, L, Afro Samurai to Run in German Film Fest". Anime News Network. August 8, 2008. Retrieved September 14, 2009. ^ "Afro Samurai Creator Takashi Okazaki Confirms Sequel". Anime News Network. October 25, 2007. Retrieved September 11, 2009. ^ "Lucy Liu, Mark Hamill Join Afro Samurai: Resurrection (Updated)". Anime News Network. July 24, 2008. Retrieved September 12, 2009. ^ a b "Afro Samurai: Resurrection Movie Debuts Sunday Night". Anime News Network. July 25, 2009. Retrieved September 14, 2009. ^ "Afro Samurai: Resurrection TV Film Nominated for Emmy (Updated)". Anime News Network. July 16, 2009. Retrieved September 14, 2009. ^ a b "Foster's Home Wins Emmy over Afro Samurai: Resurrection". Anime News Network. September 15, 2009. Retrieved September 15, 2009. ^ "Afro Samurai: Resurrection's Shigemi Ikeda Wins Emmy (Updated)". Anime News Network. August 27, 2009. Retrieved September 14, 2009. ^ "Comic-Con: Live Action Afro Samurai". Anime News Network. July 22, 2006. Retrieved October 29, 2009. ^ "INDOMINA AND SAMUEL L. JACKSON TEAM FOR LIVE ACTION "AFRO SAMURAI" FILM". 2011-07-21. ^ "アニメ『アフロサムライ』ハリウッド実写化始動！　サミュエル．L．ジャクソンがプロデューサーに決定！アニメ『アフロサムライ』ハリウッド実写化始動！　サミュエル．L．ジャクソンがプロデューサーに決定！" (PDF). 2011-07-21. ^ Yamato, Jen (January 30, 2013). "Indomina Shutters Distribution Unit And Lays Off 15 In LA Office". Deadline. Retrieved February 13, 2016. ^ "Namco to Publish Afro Samurai Video Games". Anime News Network. August 30, 2005. Retrieved September 15, 2009. ^ "Namco Bandai Announces Afro Samurai Game". Anime News Network. June 17, 2007. Retrieved September 15, 2009. ^ "Afro Samurai". Amazon.com. January 27, 2009. Retrieved September 15, 2009. ^ Szadkowski, Joseph (February 19, 2009). "Zadzooks: Review of Afro Samurai, the video game". The Washington Times. 3600 New York Ave. NE, Washington, D.C.: The Washington Times. Retrieved September 15, 2009. ^ "Afro Samurai". Amazon.com. January 30, 2007. Retrieved September 15, 2009. ^ "Afro Samurai Resurrection". Amazon.com. January 27, 2009. Retrieved September 15, 2009. ^ Green, Scott (September 19, 2008). "AICN Anime-Afro Samurai Manga, A Survey of Upcoming Events, News and More!". Austin, TX 78718-0011 United States: Ain't It Cool News/Ain't It Cool, Inc. Retrieved September 17, 2009. ^ Santos, Carlo (November 4, 2008). "Afro Samurai Blu-Ray". Anime News Network. Retrieved September 18, 2009. ^ Blind, Matt (March 10, 2009). "2009-02: Manga Top 250 Volumes and Top 100 Series for February 2009". ComiPress. Retrieved September 18, 2009. ^ "Top 100 Animated TV Series - 90. Afro Samurai". IGN. Retrieved April 16, 2013.